French adventurer; born in Strasburg in 1849; settled in Paris in 1871. He was implicated in distributing among statesmen and politicians the bribes of the Panama Canal Company, which sought to secure the authorization of the Chambers for the company's financial operations. During more than four years the name of Arton was on all lips in France. He was many times the object of violent interpellations and stormy debates in both the Chamber of Deputies and the Senate, and was a steady menace to the stability of more than one French cabinet. 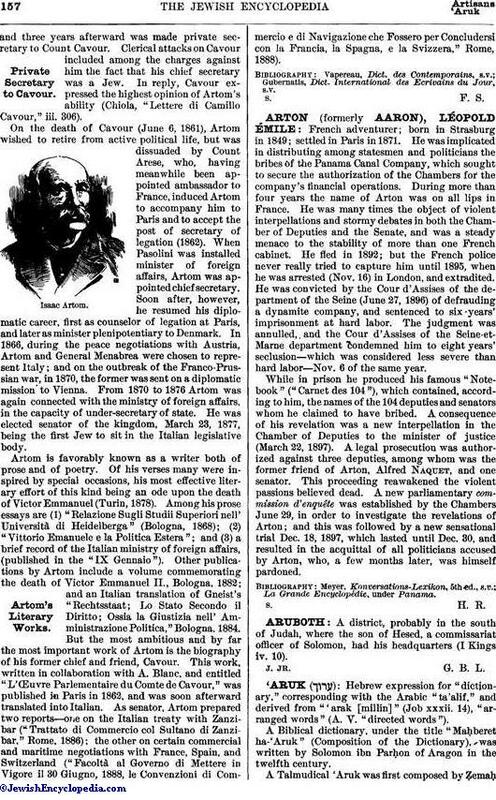 He fled in 1892; but the French police never really tried to capture him until 1895, when he was arrested (Nov. 16) in London, and extradited. He was convicted by the Cour d'Assises of the department of the Seine (June 27, 1896) of defrauding a dynamite company, and sentenced to six years' imprisonment at hard labor. The judgment was annulled, and the Cour d'Assises of the Seine-et-Marne department condemned him to eight years' seclusion—which was considered less severe than hard labor—Nov. 6 of the same year. While in prison he produced his famous "Notebook" ("Carnet des 104"), which contained, according to him, the names of the 104 deputies and senators whom he claimed to have bribed. A consequence of his revelation was a new interpellation in the Chamber of Deputies to the minister of justice (March 22, 1897). A legal prosecution was authorized against three deputies, among whom was the former friend of Arton, Alfred Naquet, and one senator. This proceeding reawakened the violent passions believed dead. A new parliamentary commission d'enquête was established by the Chambers June 29, in order to investigate the revelations of Arton; and this was followed by a new sensational trial Dec. 18, 1897, which lasted until Dec. 30, and resulted in the acquittal of all politicians accused by Arton, who, a few months later, was himself pardoned. La Grande Encyclopédie, under Panama.